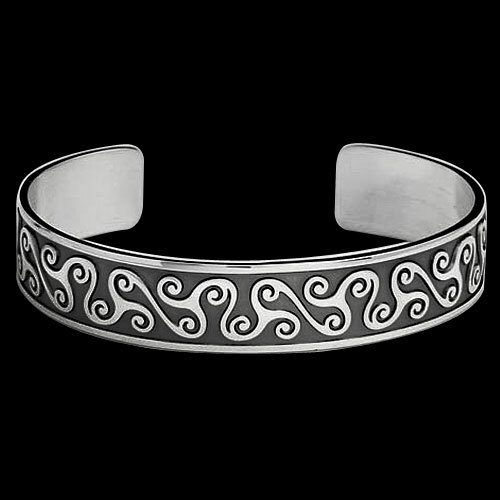 Sterling Silver Boann's Triskets Celtic Bracelet by Metal Arts Group. In Irish legend, Boann, Goddess of the River Boyne, was said to have created the Boyne by circling the Well of Wisdom, also known as Segais, counter clockwise until the water surged up and rushed down to the sea. From this, it is believed that her power exists within every river as the wellspring of rebirth and imagination. She is also seen as a symbol of poetic inspiration and insight. 6.5 x 0.6 inch Sterling Silver Boann's Triskets Celtic Bracelet by Cari Buziak. Made in USA.